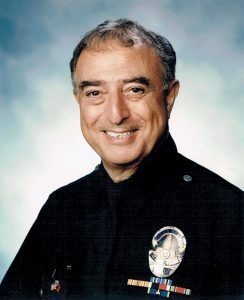 On the card were three emblems: the U.S. Navy, the U.S. Marines and the badge of the LAPD — all three organizations joined by Reserve Police Officer Eddie Kafafian, who influenced each in so many ways for so many years. Of course, there was also his work as a columnist for Variety magazine — he knew more stars on screen and off than you might imagine. Eddie and Leah’s Christmas party was the best ticket in town, on historic Genesee Avenue, south of Sunset Boulevard in Hollywood Area. His home was built in 1919, seven years before Eddie was born. On the walls of the bar was Eddie pictured with just about every iconic actor you can think of: Clint Eastwood, Robert Redford, Mickey Rooney, Jackie Gleason and Gloria Swanson; and there are framed letters from John Wayne and Judy Garland. At the celebration, Assistant Chief Bea Girmala reminisced how Eddie always asked her how she was doing, making sure everything was all right. Rare, she noted, that officers ask their supervisors about such things. Reserve Officer Trevor Ingold took upon himself the task of determining which LAPD service ribbons Officer Kafafian had earned. Turns out, quite a few. He presented the solid lineup on a plaque, a record of over 25 years of service. In the final months, Officer Ingold and his partner, Bernard Khalili, never failed to visit their friend in assisted living. In fact, so many cops — in and out of uniform — visited Eddie that he was the star on a daily basis. The humor could be ribald; Eddie enjoyed every minute of it. In 2001, Officer Kafafian was elected to the Board of the Los Angeles Police Reserve Foundation, and he most recently served as director emeritus. This author remembers partnering with Eddie years ago at the Hollywood Christmas Parade, on the lost child detail. At the very end of the shift, we finally received a lost child at the substation, a little boy about six years old. While other officers went EOW, we proceeded to take the child home, a midnight drive into Rampart Area. Eddie was talking to the young man. We finally got to the boy’s house. His parents were so grateful. I remember being the cover officer, focused on tactics and officer safety, as Eddie engaged with the parents in what I recall was some great, heartfelt advice.